A prison officer who admitted smuggling drugs and mobile phones into prison in fruit juice cartons has been jailed. 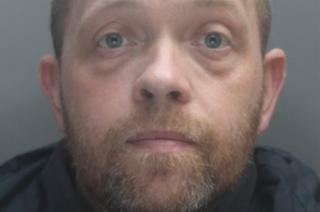 Paul Heap, 43, was caught taking heroin, crack cocaine and 2,000 steroid tablets into HMP Altcourse, Liverpool. Security staff found drugs with an estimated street value of £215,000 inside two cartons in a rucksack Heap took into the jail on 28 June 2017. Heap was jailed for nine years at Liverpool Crown Court after a judge told him he changed to the "dark side". Judge David Aubrey QC told Heap: "You in effect changed sides... to the dark side, and became involved in the evil trade of drugs in prison which have a corrupting and corroding effect on the environment you were supposed to be safeguarding." He said Heap, of Hartley's Village, Aintree, had "cast a shadow" on his colleagues after 14 years working as a prison officer. He said he "contributed to aggravate and exacerbate the very issue you were employed to seek to control and protect" in a "grave breach of trust". Heap's "corrupt dealings... brought shame upon your family", the judge added. The court heard more than £9,000 in cash, which he initially claimed was savings, was also found in a search of his house. He admitted seven charges of possessing drugs with intent to supply, three counts of conveying a prohibited article and one charge of possessing cash which was criminal property.Andrew McInnes, defending, said a psychiatric report showed Heap was suffering a "depressive episode" and had issues after witnessing a prison suicide. He also said financial pressures led Heap "to become involved in this enterprise".